All 201 recipes under 10 net carb grams. 80% of the recipes take 15 minutes or less to prepare. Special icons quickly identify each recipe's optimum cooking method and time-saving appliance needed--tabletop or outdoor frill, oven, skillet, slow cooker. Handy charts show the best and fastest cooking methods for meat, poultry, and fish. Exclusive low-carb menu plan features a variety of recipes for all tastes--two weeks of weeknight meals and one week of brown-bag lunches. Streamlined shopping list for each recipe. 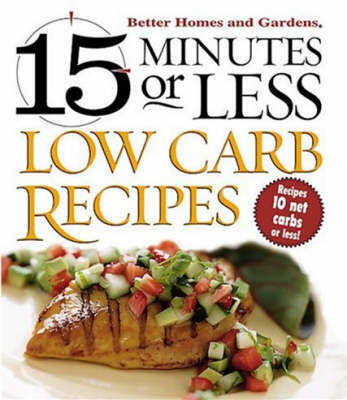 Includes tips and secrets to help low-carb diets work. 5-Ingredient Grilling: More Than 200 Flame-Seared Recipes with 5 Ingredients or Less! Better Homes and Gardens - More From Your Wok. Better Homes and Gardens Baking Step by Step: Everything You Need to Know to Start Baking Now! Better Homes and Gardens New Junior Cook Book. Kids' Favorites Made Healthy: 150 Recipes You And Your Child Will Love! Knorr Fast and Flavorful for Everyday and Weekend Too! Quick, Quicker, Quickest: 350 delicious meals ready in 20, 30, or 40 minutes! Quick-Fix Family Favorites: 354 Easy Recipes! So-Easy Slow Cooker: 203 Sensational Recipes!